we had a year ago, just before some cousins moved far away. It was an event planned to balance the fact that the girls got a tea party. in Indonesia and I knew there would not be a boy who would not want to eat that kind of turtle. a cream puff caterpillar to add some variety. So . . . you have probably figured out by now what to do . . .
Bring butter, salt and water to boil in a small pot. Remove from heat and quickly add 1 cup flour, stirring vigorously, until it completely loosens from sides of pot. Beat in eggs, separately, with whisk - until smooth. It will slither about a bit, but keep stirring until each egg is mixed in well. Using a small glass, lightly outline a circle and place legs and head, using a baby spoon. Using a large spoon, place body in the center. Bake for 15 minutes, then turn down temperature to 350 F and bake another 25-30 minutes. Fill a piping bag with pastry and press seven quarter to loony sized circles touching each other. Or just use a teaspoon, placing tiny cream puffs side by side. Bake at 450 F for 15 minutes, then turn down oven to 350 F and bake 25 minutes. In small saucepan, bring 1 1/2 cups milk to boil. In small bowl, mix flour, sugar, 1/4 cup milk and egg yolks until well blended, then another 1/4 cup milk. TIP: you can make the bodies ahead and freeze them. On day of party, fill them and refrigerate them uncovered so they do not get soft. You can also store them in a large fridge drawer. Dust lightly with powdered sugar if you like. No girls allowed - except for Grammy! The turtles are about the cutest cream puffs I have ever seen. I will need to make these for my grandson. Thanks for sharing the idea. What fun to have with your grandsons! I remember that post - this is so brilliant! Such fun memories made. I wonder how often these boys will say to each other, "Remember that critter party? "...So well donr,Anneliese..I loce it. Dear anonymous, I'm happy to hear you tried them but sorry about the problem you encountered. Not having seen the process of how my recipe was interpreted it is hard to say what went wrong. The pastry can be tricky if the temperature is not right in the process of when the flour gets added and then the eggs. The eggs need to be fully beaten in, one at a time. The baking temperature has to be just right as well and you cannot open the door in the first 10 - 15 minutes to peek. I've read that they can flatten even after taking them out of the oven, so it is important to be sure they are a nice golden brown, rather a bit darker, than lighter. If they are not fully cooked inside, the steam can collapse them as they cool. I have not done this but some poke a tiny hole on the side when they come out of the oven to help the steam escape. 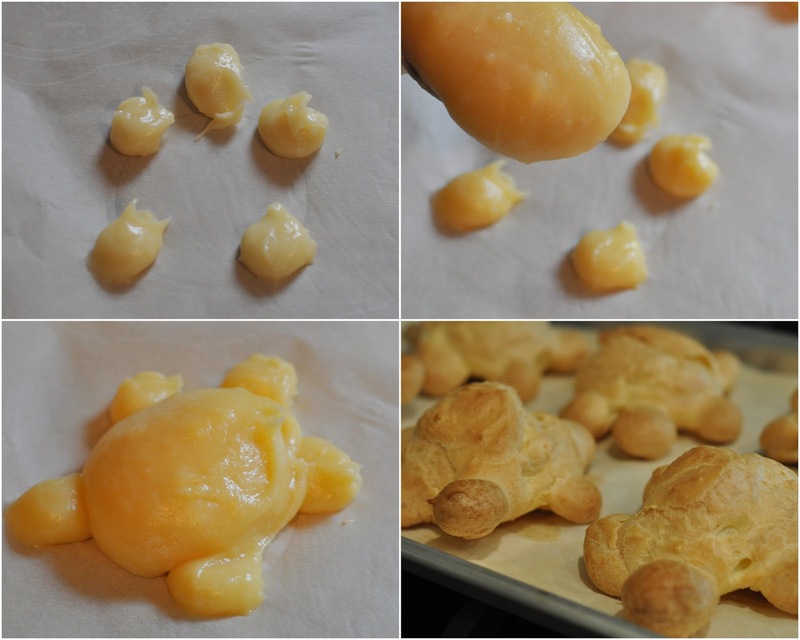 I don't know if you have ever made just plain cream puffs. It would be less work to try them that way, to be sure you get the process. I have had the experience of something turning out terrible the fist time and then working perfect the second time... only guessing what I did wrong the first time. Sometimes it is worth it to try again. All the best!